4MM BUTTERFLY C.Z. DERMAL HEADS IN CLEAR AND PINK C.Z. ASSORTED.THESE DERMAL HEADS CAN BE USED WITH ANY OF THE DERMAL BASES WE SELL INCLUDING OUR 316L BASE AND OUR G23 TITANIUM BASE. 4MM CABACHON STONE DERMAL HEADS.THESE HEADS CAN BE USED WITH ANY OF THE DERMAL BASES WE SELL INCLUDING OUR 316L STEEL BASE AND OUR G23 TITANIUM BASE. HEALING POST DERMAL ANCHOR HEAD.THESE DERMAL ANCHOR HEADS CAN BE USED WITH ANY OF OUR DERMAL ANCHOR BASES WE SELL INCLUDING OUR 316L BASE AND OUR G23 SOLID TITANIUM BASE.316L SURGICAL STEEL 14 GAUGE. DERMAL DIVER BASES.THESE BASES ARE USED TO BE IMPLANTED UNDER THE SKIN AND THEN YOU SCREW IN A GEM TOP(JUST LIKE A MICRODERMAL BASE). 316L SURGICAL STEEL DERMAL DIVER BASES.THESE BASES ARE USED TO BE IMPLANTED UNDER THE SKIN AND THEN YOU SCREW IN A GEM TOP(JUST LIKE A MICRODERMAL BASE). THESE CAN BE USED WITH ANY OF THE MICRODERMAL BASES WE SELL INCLUDING OUR 316L SURGICAL STEEL BASE AND OUR G23 SOLID TITANIUM BASE. DOOR KNOCKER C.Z. DERMAL ANCHOR HEADS IN 13 C.Z. GEM COLORS.THESE DERMAL ANCHOR HEADS CAN BE USED WITH ANY OF OUR DERMAL ANCHOR BASES INCLUDING OUR 316L BASE AND OUR G23 TITANIUM BASE.TOP QUALITY 316L SURGICAL STEEL 14G. FLOATING C.Z. 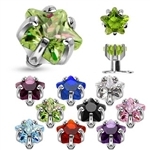 FLOWER DERMAL HEADS IN A VARIETY OF COLORS INCLUDING CLEAR C.Z.,A.B. IRRIDESCENT C.Z.,PINK C.Z. AND RED C.Z. GEMS.TOP QUALITY "AAA" C.Z. BRILLIANT GEMS.THESE CAN BE USED WITH ANY OF OUR MICRODERMAL BASES INCLUDING OUR 316L BASE AND OUR G23 SOLID TITANIUM BASE. FLOATING STAR CLEAR C.Z. MICRODERMAL HEADS.THESE FIT ON ANY OF OUR DERMAL BASES.TOP QUALITY 316L SURGICAL STEEL.TOP QUALITY "AAA" QUALITY CLEAR C.Z. GEMS. GLITTER DERMAL HEADS IN 5MM.FOR USE WITH ANY OF OUR DERMAL BASES INCLUDING OUR 316L STEEL BASE AND OUR G23 TITANIUM BASE.TOP QUALITY 316L SURGICAL STEEL.COMES IN BRIGHT AND BRILLIANT GLITTER COLORS INCLUDING PURPLE,RED,FLOURESCENT GREEN,ROYAL BLUE AND PINK. GEM INFINITY C.Z. DERMAL HEADS SHOWN BELOW.THE SIZE OF THE HEADS ARE 5MM AND THEY FIT ANY OF THE DERMAL BASES WE SELL.TOP QUALITY 316L SURGICAL STEEL "AAA" TOP QUALITY CUBIC ZIRCONIA'S,BRIGHT AND BRILLIANT. THESE ALL NEW SKIN DIVERS ARE INTERNALLY THREADED SO YOU CAN CHANGE THE GEM TOPS TO ANY COLOR OR SIZE YOU WANT,JUST LIKE A MICRODERMAL.THE BENEFIT OF USING SKIN DIVERS ARE THEY ARE EASIER TO INSTALL SINCE THEY ARE SO TINY AND EASIER TO TAKE OUT IF NEEDED SINCE THERE IS NO HOLE FOR THE SKIN TO GROW THROUGH. COLOR C.Z. GEM INTERNALLY THREADED SKIN DIVER TOPS IN 13 COLORS,FOR USE WITH OUR INTERNALLY THREADED SKIN DIVER BASES.TOP QUALITY 316L SURGICAL STEEL 16 GAUGE. ***FINALLY A SKIN DIVER THAT YOU CAN CHANGE THE HEAD ON! PLEASE NOTE: YOU ARE BUYING THE Internally Threaded Skin Diver Gem Top ONLY,THE SKIN DIVER BASE IS SOLD SEPARATELY MULTI C.Z. 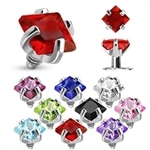 GEM DERMAL ANCHOR HEADS IN 13 COLORS SHOWN BELOW.THESE DERMAL ANCHOR HEADS HAVE A COLOR C.Z. IN THE CENTER AND 6 CLEAR C.Z. GEMS SET AROUND IT.THESE CAN BE USED WITH ANY OF OUR DERMAL ANCHOR BASES INCLUDING OUR 316L BASE AND OUR G23 TITANIUM BASE.TOP QUALITY 316L SURGICAL STEEL 14 GAUGE. 5MM OPAL STONE COLOR MICRODERMAL HEADS.THESE CAN BE USED WITH ANY OF THE DERMAL BASES WE SELL INCLUDING OUR 316L SURGICAL STEEL BASE AND OUR G23 SOLID TITANIUM BASE.COMES IN POPULAR COLORS SHOWN BELOW.316L SURGICAL STEEL. PRONG SET 4MM C.Z. GEM DERMAL HEADS. Made as one piece. Not welded. Autoclave safe. COLOR STAR ENCAPSULATED IN CLEAR ACRYLIC DOME ANCHOR HEADS.COMES IN RED,BLUE,GOLD,SILVER AND GREEN STARS.THESE CAN BE USED WITH ANY OF THE DERMAL BASES WE SELL INCLUDING OUR STEEL BASE AND OUR G23 SOLID TITANIUM BASE.TOP QUALITY 316L SURGICAL STEEL. C.Z. GEM SKIN DIVERS.HANDCRAFTED FROM 1 SOLID PIECE OF 23 6Al-4V-Eli TITANIUM,MORE SPECIFICATIONS SHOWN BELOW.SKIN DIVERS SHOULD BE IMPLANTED BY EXPERIENCED PROFESSIONALS ONLY. SURFACE BARBELLS 14 GAUGE WITH A 45 DEGREE ANGLE.TOP QUALITY 316L SURGICAL STEEL 14 GAUGE. Star Opal Stone Dermal Top. OPAL STONE COLOR MICRODERMAL HEADS.THESE CAN BE USED WITH ANY OF THE DERMAL BASES WE SELL INCLUDING OUR 316L SURGICAL STEEL BASE AND OUR G23 SOLID TITANIUM BASE.COMES IN POPULAR COLORS SHOWN BELOW.316L SURGICAL STEEL. Steel Flat Disc Dermal Anchor Top. 5MM FLAT DISC DERMAL ANCHOR HEADS.THESE HEADS CAN BE USED WITH ANY OF OUR DERMAL ANCHOR BASES INCLUDING OUR 316L BASE AND OUR G23 TITANIUM BASE. Steel Flat Disc Dermal Anchor Top 10 Pack. 3MM C.Z. GEM DERMAL HEADS.THESE ARE TOP QUALITY AND LOOK VERY COOL ON THE SKIN,IT'S LIKE A DIAMOND ENGAGEMENT RING FLOATING ON YOUR SKIN. THESE CAN BE USED WITH ANY OF OUR DERMAL BASES WE SELL INCLUDING OUR 316L BASE AND OUR G23 TITANIUM BASE. 3MM FLAT DISC COLOR TITANIUM ANODIZED DERMAL ANCHOR HEADS.COMES IN GREEN,PURPLE,BLACK,DARK BLUE AND RAINBOW.THESE DERMAL ANCHOR HEADS FIT WITH ANY OF THE DERMAL ANCHOR BASES WE SELL INCLUDING OUR 316L BASE AND OUR G23 TITANIUM BASES.316L SURGICAL STEEL 14 GAUGE. COLOR TITANIUM ANODIZED SCREW DERMAL ANCHOR HEADS.COMES IN RAINBOW,GREEN,BLACK,PURPLE AND BLUE.THESE DERMAL ANCHOR HEADS CAN BE USED WITH ANY OF OUR DERMAL ANCHOR BASES WE SELL INCLUDING OUR 316L BASE AND OUR G23 SOLID TITANIUM BASE.316L SURGICAL STEEL 14 GAUGE. 10 PACK OF COLOR TITANIUM ANODIZED SCREW DERMAL ANCHOR HEADS.COMES IN RAINBOW,GREEN,BLACK,PURPLE AND BLUE.THESE DERMAL ANCHOR HEADS CAN BE USED WITH ANY OF OUR DERMAL ANCHOR BASES WE SELL INCLUDING OUR 316L BASE AND OUR G23 SOLID TITANIUM BASE.316L SURGICAL STEEL 14 GAUGE. U.V. DERMAL HEADS IN 5MM.FOR USE WITH ANY OF OUR DERMAL BASES INCLUDING OUR 316L STEEL BASE AND OUR G23 TITANIUM BASE.TOP QUALITY 316L SURGICAL STEEL.COMES IN BRIGHT AND BRILLIANT U.V. COLORS INCLUDING PINK,GREEN,BLUE,RED,BLACK,PURPLE,WHITE.